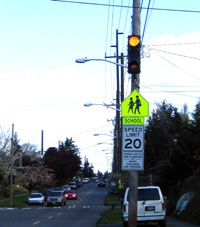 In the early 2000s, the Seattle Department of Transportation began a project to define and update placement standards for the 20 mi/h school zone and school crosswalk signs. The goal was to provide consistency of use for better motorist understanding in order to increase motorist compliance with the speed limit. A secondary goal was to have better internal guidelines on sign placement to increase the consistency of responses to requests for 20 mi/h school zone signs. The State of Washington requires that 20 mi/h school zone signs be used when a School Patrol is present at a location where there is no form of traffic control. In Seattle, School Patrol is an optional student program run where members help other students cross safely, but must remain in sight of the school. By contrast, crossing guards are adults employed by the Seattle Police Department. Participating students are typically in the fifth grade and have an adult supervisor. In an effort to improve motorists' understanding and compliance, a new school zone sign that reads WHEN LIGHTS ARE FLASHING OR WHEN CHILDREN ARE PRESENT and flashing beacon will replace the sign reading WHEN CHILDREN ARE PRESENT and will be set to flash during the times of the day that children are most likely to be traveling to and from school. The opportunity for this project occurred as SDOT upgraded all school crosswalk signs from yellow to fluorescent yellow-green, and changed the school sign at the crosswalk to include an arrow pointing to the crosswalk itself. The field checks necessary to perform the sign replacements presented an opportunity to bring consistency to all school speed zone signs. The pre-existing conditions of each location varied. Fluorescent yellow-green signs were already replaced on principal arterials throughout the city. All other school crosswalks had yellow signs. Type of traffic control (uncontrolled, stop sign, traffic signal, crosswalk signal). Type of street (arterial street or residential street). Whether the crosswalk was attended (School Patrol, adult crossing guard, or unattended). 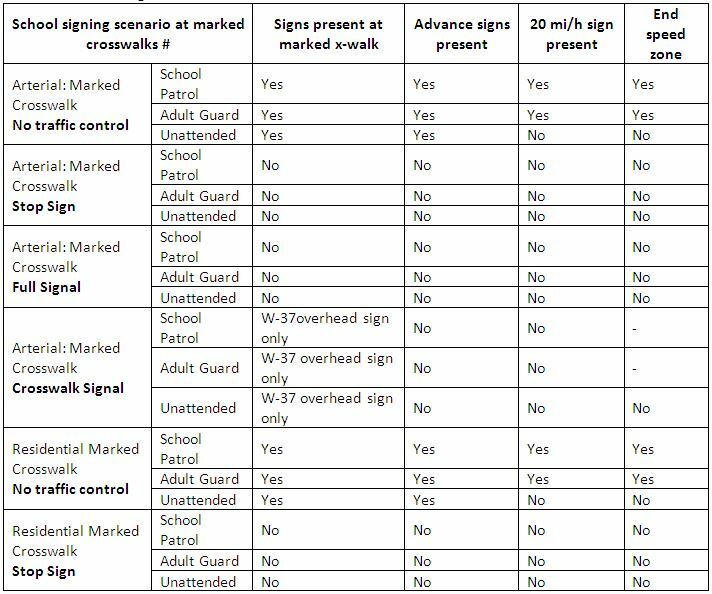 It was not feasible to survey the entire city (the City of Seattle has over 300 uncontrolled marked school crosswalks alone), so the surveyor sought to find a minimum of five examples of each combination (there were a total of 18 combinations). When the survey was complete, the city drafted guidelines that both met the department's goals of consistency and compatibility with existing conditions. The new guidelines preserved the 20 mi/h school zone signs at all uncontrolled locations with an active School Patrol presence, which was required by state law, while calling for the addition of 20 mi/h signs at uncontrolled crosswalk with adult crossing guards. The reason for this decision was that the locations where adult guards are typically posted also saw the highest number of students crossing. Therefore, reducing driver speeds at the locations likely to see the most student traffic focused attention on the intersections that would benefit the most students. See Table 2 for placement guidelines. Taking into account the number of lanes of motor vehicle traffic, the average daily traffic (ADT) and motor vehicle speeds, staff at SDOT evaluated all marked crosswalks qualifying for a 20 mi/h school speed zone. None of these locations had more than two lanes, and only a few had a speed limit higher than 30 mi/h. Therefore, the locations were ranked by ADT. Twelve locations ranked highest on selected criteria for the first year of implementation of flashing beacons. All locations had adult crossing guards. While almost every marked crosswalk considered for this treatment was an uncontrolled marked crosswalk, there were several locations that had crosswalk signals (also referred to as half-signals). With guidelines in place, the city began establishing the new school zones and replacing existing signs. Signs on minor and collector arterials were replaced in 2002. Signs on non-arterial streets were replaced in 2003. In the program's first year, new speed zone signs with flashing beacons were installed at 12 locations. An additional 14 locations received beacons in second year (no funding has been identified for further implementation). Two locations on the prioritization list were not implemented due to construction and timing issues. Defining specific evaluation criteria was difficult for this project because it was not known until halfway through which locations would change and which would stay the same. Because all signs were being replaced with fluorescent yellow-green school signs, it complicated the effort to understand the effects of the 20 mi/h speed zone by itself. Therefore, the evaluation could best be examined in terms of public feedback and internal opinion. The adult crossing guards responded positively to the new speed zone signs, which were new to many of their sites. The creation of consistent guidelines for the establishment of 20 mi/h zones has resulted in clearer communication to the public about the reasons and placements of signs. There have been some negative comments from citizens, however, who wonder why the school speed zones are being established at the locations with an adult crossing guard rather than the ones that lack a guard. This particular complaint requires ongoing explanation of the advantage SDOT sees in focusing attention on the places where the most children cross. Before/after speed assessments were performed for several of the flashing beacon locations to determine if motorist speed limit compliance increased. The "before" data show a clear disregard for the 20 mi/h school speed zones. Before speeds when children were present had ranged from 32 mi/h to 40 mi/h. Speed data were also collected several months after the signs and beacons were installed. In all but one case, vehicle speeds when an adult crossing guard was present were lower following sign and beacon installation. The largest decrease in speed noted was a 22 percent decrease (the 85th percentile speed dropped from 37 mi/h to 29 mi/h). Despite the reduction in vehicle speed, the range of speeds measured (29 mi/h to 34 mi/h) were still well above the 20 mi/h speed limit. When considering sign placement, SDOT relied directly upon the presence of crossing guards. Other jurisdictions may want to consider other criteria in the placement of 20 mi/h speed zone signs. Criteria that could be considered include the distance from the crosswalk to the school and the number of students using the crosswalk. An important detail to keep in mind is the amount of annual survey work that must be conducted to keep signs current. While the number of students using the crosswalk is important, collecting this information for hundreds of crosswalks could be a large task. It was very useful to do the survey work and create guidelines for sign placement throughout the city. It is an excellent way to gain internal concurrence on guidelines and to take time to verify that current practices are still useful. While the speed study analysis did not show as large a drop in vehicle speed as SDOT would have liked, it did result in reduced vehicle speeds within the reduced speed school zones. A notable result of the new beacons has also been more effective enforcement by SDOT. Officers are given a list of the beacon locations and the times they will be in effect. Targeted enforcement is therefore possible, and the SDOT keeps a log of the times the beacons flash which reduces the number of motorists who can contest a ticket. The upgrade of the school crosswalk signs was funded through state grant funding. The survey work and background gathering necessary for this project were made possible by help from a graduate school intern and a transportation crew worker on light duty. The first year of flashing beacon installation was funded by a state grant, and the second year was funded by SDOT.